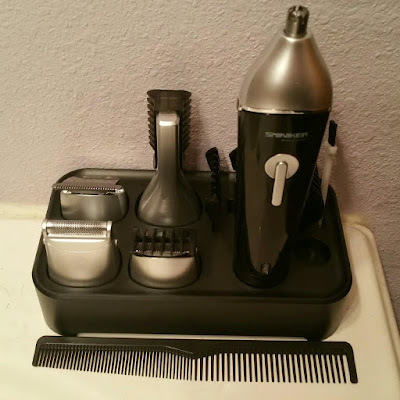 5 in 1 for complete trimming and styling of facial hair for friendly & convenience using, including a full trimmer, detail trimmer, nose trimmer, beard and mustache trimmer and stubble comb. Turbo boost feature for cutting extra thick & coarse hair, nose & ear trimmer safe, easy & hygienic grooming. Cord/cordless charging indicator, and rubber grip panel for collecting all drives and accessories. Washable heads, charging stand, cleaning brush. Another positive selling point, in my opinion, is that this 5 in 1 grooming kit is affordable! It's a great kit for a great price. It is easy to use and has the perfect little organizer to keep everything together and within your reach! Disclaimer: I received this product through Tomoson at a highly discounted price in exchange for review. All opinions are 100% my own and truthful. No other compensation was received.